The 229 3-Way, Pan-and-Tilt Head from Manfrotto has a load capacity of 26.5 lb and can be attached to tripods or other support systems that feature a 3/8"-16 mount. It includes an integrated RC0 quick release cam lock and a 030-14 Quick Release Plate. RC0 compatible quick release plates such as the 030-14 can removed from the head by pulling the cam lock's spring-loaded lever, which also allows the plate to be instantly reattached. Cameras or accessories that are compatible with a 1/4"-20 mount can be connected to the 030-14 Quick Release Plate, which measures 2.6 x 2.6 x 0.4" and has a rubberized, non-slip surface. The head can be rotated 360°, tilted 90° forwards or 25° backwards, as well as 30° sideways for portrait orientation. Each of these three movements function independently of each other, have dedicated control handles, and can be locked into place by twisting each corresponding handle's rubberized grip. To promote fast, repeatable, and accurate device positioning, the 229 3-Way, Pan-and-Tilt Head also includes dedicated angle scales for its rotational and sideways tilt movements that are designed for easy visibility. Box Dimensions (LxWxH) 8.0 x 4.9 x 4.6"
229 3-Way, Pan-and-Tilt Head with 030-14 Quick Release Plate is rated 4.8 out of 5 by 48. Rated 4 out of 5 by bruto from This head is adjustable I have the older 3039 head, which is similar, and if you are not aware of this, you should know that all the tensions on this head can be adjusted. 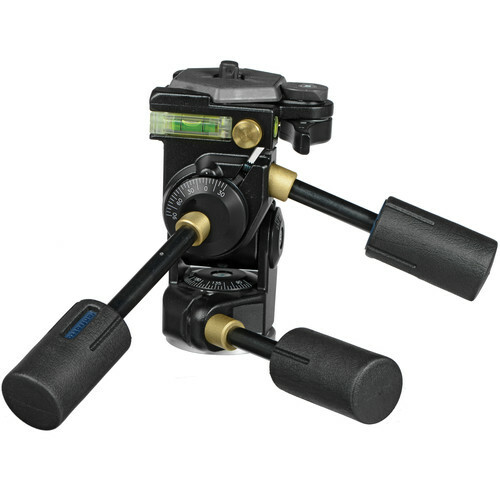 It is similar to the old 4047 three way head, but it uses a different handle arrangement with adjustable tension. Under the handles for pan and tilt you will find 13 millimeter nuts, and on the back side of the horizontal tilt, another nut. Changing the tension of those nuts will set the drag for that axis when the handle is released. If one axis is stiff or loose for your purposes, you can tune it to how fast you want your equipment to move. It's ideal for big heavy lenses that flop on other heads, though it is too slow to follow action well. For the horizontal tilt you will need a very thin walled socket. The others can be done with a wrench. Rated 5 out of 5 by Mountain Man from I wouldn't buy anything else!!! I purchased this for my digital camera over 4 years ago and I'm now getting ready to use it on my new L.F. Walker 4X5 Field Camera. This thing is rock solid. When you tighten the knobs in any position, they stay locked with no slipping. It works just as good as the day I purchased it. I've used other light weight tripods and heads and they just don't stand up to the high winds and harsh conditions I encounter like this does. A little on the heavy side and a little awkward to carry, but the 229 Super Pro Head is the one I always choose even on longer hikes. Rated 5 out of 5 by Utah Jake from Great all around head I've shot pro video and stills for 30 years and this is the head I'm using on 90% of my work now. With the price of so called pro equipment the way it is, I would expect to pay double the amount for this quality. I mounted it on my old 3046 tripod thats been in the corner for 10 years and it is now my main tripod for my Nikon D300 and DX2. Rated 5 out of 5 by John T. from Weighs a ton, but worth it..... I do macro and landscape photography (including time lapse & stars). A sturdy tripod and head is essential. I prefer a 3-way head rather than a ball. This head is fantastic. Rated 5 out of 5 by Anonymous from Love this piece of equipment! We have three stations with this ball head that are used daily for 8+hours and they never loosen or get off kilter. I would buy 10 more of the same if needed! Highly recommend. Rated 5 out of 5 by EQ dude from Great head! This head is a workhorse at my place of employment. We've used these for years and they only occasionally break (usually from being dropped). They are pretty heavy duty and hold medium format cameras easily. They even hold large format cameras (Sinar) with ease. The only negative thing, which isn't really a negative, is that they're are pretty heavy. If you're looking for something to travel with, I wouldn't recommend this one. Too big and bulky. Other than that, this is a great one. Wes,If you still need this, contact me, and i will save one down for you. Does this fit an Induro Carbon tripod let set? Thank you. Hi Collin,I purchased this head to go on a Manfrotto 058 tripod ,A good heavy solid head for a good solid heavy tripod.This is great for studio or location where not to much moving around.For location I recently bought a Gitzo GT2542T with a Arca swiss monoball Z1 head , amazing especiallyfor interiors where head is very fast and precise to use. I have a Bogen 3205 will this fit? I'm not sure if the Bogen top plate has a 1/4-20 or 3/8 screw. The based of the Super Pro Head is 3/8 . If your tripod is 1/4-20, you can add a bushing to convert it to 3/8 . However, if what you're mounting on the Super Pro Head is truly heavy, like a 600/4, you are going to put a lot of strain on that 1/4-20 screw. So it depends on what you're going to use the Super Pro Head for. Does this come with the hexagon plate? Yes, mine came with one. It's a great product. In the normal position, you cannot. However if you mount it backwards and have the tilt control pointing directly away from you, you will be able to point straight up. The gear handle will now just be on the far side of your head, pointing away from you. Although maybe slightly awkward at first, it would be something you would quickly get used to and it would be fully functional.